a while back (in august!? ), i had the great pleasure of celebrating lanz's birthday at her home. she hosted a natural dyeing party. i have always wanted to do more natural dyeing and even took a class at the oregon college of art and craft way back when i was newly pregnant with colden. this time i had a whole slew of stuff to try dyeing, but i didn't want to take up all the room in the communal pots. (plus, lanz and i have some future plans for more natural dyeing dates!) so i chose these onesies that needed the transformation the most - one stained with mud, the other with watermelon. mud went into the onion skin pot and watermelon into the madder. the onion skin one (left) was actually a brilliant gold shade until i washed it in hot water, and next time i will try a vinegar soak to see if i can get more of the gold to stick around. i soaked the madder in vinegar before washing and i think it helped. i just love them and i'm excited to do more! you should have seen the silks coming out of these pots! oh so lovely! and i fully intend to get my own indigo pot a-brewing. maybe this weekend? 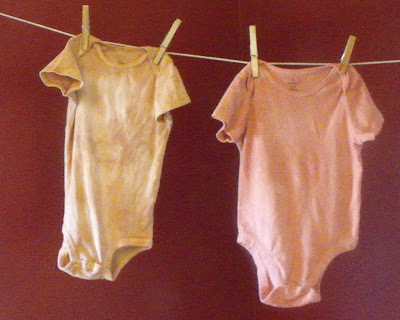 i did use an alum mordant for the onesies, but there are some dyestuffs that do not require any. one is walnut. 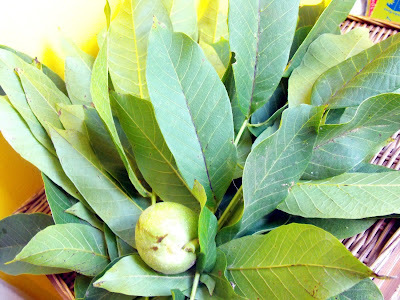 i've read most places to use crushed walnut hulls, but one of my books said you could do it with leaves in a sealed pot left for one week. i did it, after a neighborhood stroll, and now my week is almost up! i put lots of different bits of wool and such in to see what happens! i am in search of a giant pot for doing larger pieces and batches. i plan on pretty-ing up some grey and tan sweaters from the bins with some lichen (also needs no mordant). this will require more hiking in my future. oh yeah.